Home Gadgets Should I Buy an iPhone 7 Or a Galaxy Note 7? The latest model of Samsung – Galaxy Note 7 combined the design of Samsung Galaxy S7 and the business-oriented phablet style. It became popular in no time and raved outstanding reviews from ordinary users as well as from the business community. It came in mid-august, a month or two earlier before Apple launched its new flagship phone. Now as the both phones are in the market – even if we have discovered iPhone 7 at distance up till now and almost all features of Note 7 are familiar to us – we still can decide which phone is going to lead. It is already known to many users that Samsung Galaxy Note 7 borrowed its style from Samsung Galaxy S7 and it won’t be wrong to say that it is the most favorite design in the market. Its charming dual-cure display, all-glass back, and the most remarkable of all, its shiny finish that changes with the intensity of the light are all breathtaking. On the contrary, iPhone 7 looks more like the past year’s iPhone 6S and which wasn’t much different from iPhone 6 – and it wasn’t considered much of a looker either. We can notice slight differences to iPhone 7; the ugliest aspect of iPhone 6 is rectified with the help of rejigged antenna design. Apple completely abandoned 3.5 headphone jacks. It also has a newly fixed home button. But, both rejigged antenna and the home button have less to do with aesthetics. There is good news for Apple lovers who loved previous all-black-colored models. Black is back and in multiple shades – dark black and glossy piano black etc. If you are looking for multiple covers for both Samsung and Apple mobiles which are both aesthetically beautiful and efficient, you can explore reliable covers and many other accessories on Groupon. When it comes to the matter of robustness, we are surely going to appreciate Apple because 6S was surprisingly rugged phone that could stand to scratches and nicks pretty well and we expect iPhone 7 to be the same. On the other hand, new phones of Samsung do not seem to be avoiding scratches even by the use of Gorilla Glass 5 by the Samsung Company. When it comes to the matter of taking a dip Samsung is certainly more reputed because the Samsung mobile is IP68 certified while none of the Apple mobiles have reached this far. However, iPhone 7 is IP67 certified. Galaxy Note has 5.7-inch QHD, AMOLED display and it is considered the best display in terms of business. Samsung Note has the same Quad HD resolution with 518ppi pixel density. The great improvement that Samsung made to its new model is the inclusion of HDR, with the help of which you can capture more high-contrast and vivid photos. On the other hand, the display strategy of Apple remains a bit static. The iPhone 7 has a 4.7-inch display and pixel density 326ppi. While the iPhone 7 plus has a 5.5-inch display and pixel density 401ppi. IPS LCD technology is used in Apple phones as was used previously. One difference between the new model of iPhone and the previous ones is that Apple has given new models a wider color gamut. Samsung Note certainly isn’t something that is under powered, but the chip it uses is that of the Samsung Galaxy S7 and S7 Edge. This chip – as already used in S7 – was far ahead of A9 CPUs used in Apple’s 6S. But Apple has now debuted a new generation A10 fusion chip, and it is considered a beast. Apple continuously kept on increasing the CPU performance as it introduced different models in the market. A9 was 60 to 70% faster than A8, and A10 is 30% faster than A9. Despite the fact that Samsung has double ram than that of the iPhone – 4 GB as compared to 2 GB, and Apple’s iPhone Plus with 3 GB – but it’s not a useful comparison because Samsung Android functioning is entirely different from Apple IOS. Despite its use of smaller ram, Apple phones are always considered smooth. Apple has a dual lens rear camera while the Galaxy has the widest aperture at both the front and the back camera. Apple has two 12 megapixel sensors, one is wide and the other is telephoto. The apertures of both lenses are different; the wide-angle sensor has f/1.8 and the telephoto has f/2.8. Apple device also has quad-LED flash and optical image stabilization. Samsung galaxy’s dual megapixel has 12-megapixel back camera like those of the S7 and S7 Edge. Its aperture is f/1.7 and like Apple, it too has optical image stabilization and dual LED flash. The front camera has a wider aperture than both the iPhone 7 and iPhone 7 Plus. It means that the Samsung front camera can perform better in low light. 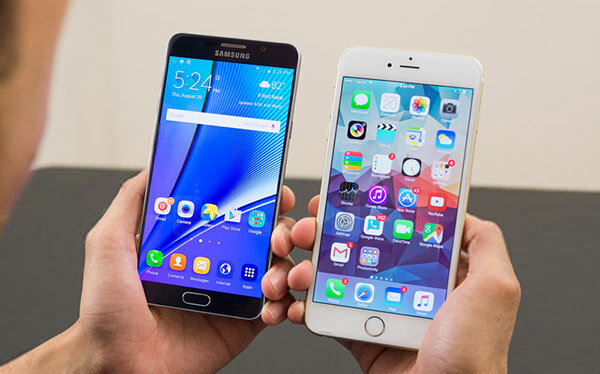 With the help of comparison and contrast of all the necessary features of both Apple’s iPhone 7 and Samsung’s Galaxy Note 7, you will now be able to decide which phone is better for you. This guest post is written by Lisa Myers, She works at Rebates Zone.